One of the things that’s pretty hard to do while you’re getting your hair cut is check for the time. You can’t just glance at your watch or check your phone for the time, not with your arms under that cape thing they put around you to keep the hair away. One thing I resort to is glancing at the reflection of the clock in the mirror, if I’m really pressed for time. It’s not the easiest (or hardest) thing to do, and that’s probably what the folks over at Cybermoon were thinking when they came up with this clock that not only has a backwards display, it actually runs backwards too. People who try to read the time by looking at the clock directly might have some difficulty doing so, but not when you’re the man (or woman) in front of the mirror. 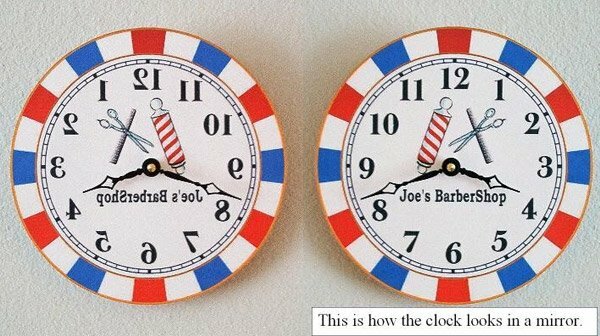 These Barbershop Mirror Clocks go for $27 (USD) over at Cybermoon’s shop at Etsy.